Qantas flights will resume by mid-afternoon today (31 October) after the airline was ordered to call off its decision to ground its entire fleet in the wake of industrial action. The airline and trade unions were told by independent arbiter Fair Work Australia to resume its halted services, which have left thousands of passengers stranded. The airline, which decided on Saturday to ground all aircraft, and three unions were told to return to the negotiating table. Qantas said that 68,000 passengers had been affected and nearly 500 flights cancelled, at a cost to the airline of around £13m a day. There will now be up to 21 days of negotiations, during which time no industrial action is allowed to take place. The Australian government, which appointed the industrial tribunal, welcomed the decision. 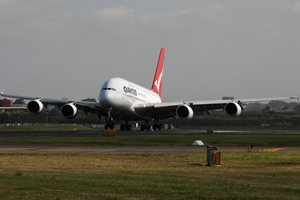 Alan Joyce, Qantas's chief executive, said: "This is a good outcome that will enable us to begin operating flights this afternoon on a limited schedule with the approval of the regulator, Casa. "Operations will resume progressively from this afternoon. Our focus is bringing our schedule back to normal as soon as possible. Safety will remain our first priority at all times. "The industrial process has now passed into the hands of the independent umpire. All parties will be treated equally and we will respect the decisions that are made."